Comments: Foraging at night, deer mice are known to cache their food in bird nests, mattresses, shoes and teapots. Their fur is reddish-brown on their back and white on their belly. They have large hairless ears, white feet, and a bicolored tail. Females can produce up to 10 litters per year with 4-5 young per liter. 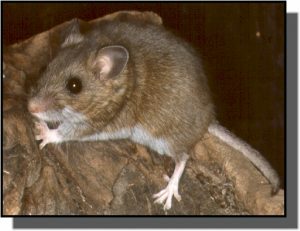 Deer mice are common prey for most predators. Their maximum lifespan is 2 years. Distribution: Deer mice are the most widespread rodents in North America, living in many different habitats from Mexico to Alaska. They are found in woodlands, shrublands, and prairies in Kansas. Food: Deer mice feed on green vegetation, nuts, berries, fruits, seeds, and insects.